TEN months ago the Trump administration took aim at steel and aluminium imports, giving itself a year to decide whether they threatened national security and, if so, what to do about it. On February 16th it concluded that America is indeed under threat. The president has until mid-April to choose whether to respond. The reports handed to Donald Trump by the Department of Commerce, which led the investigations, describe America as effectively under siege. Its steel industry might struggle to respond to a crisis similar to the second world war, they fret, as foreigners are filling a third of American demand for steel, even as 28% of national capacity lies idle. The share of primary aluminium (the kind smelted from ore, rather than recycled metal) that is imported is 91%, and 61% of local smelting capacity lies cold. Doubters can point out that the Department of Defence requires a tiny slice of American steel supply, and that America’s largest supplier for both metals, Canada, is an ally (see chart). The authors claim to see the bigger picture. America’s economic security is at stake. The recommendations aim to cut metal imports by an amount equal to 12% of current American demand. That would reduce idle capacity to 20%. Three options are presented: a broad tariff; a stiff and similarly broad quota; or a mixture that would hit some countries with a harsher tariff and leave the rest with a larger quota. Each would have nasty side-effects, not mentioned in the report. The suggested tariffs of 24% on steel and 7.7% on aluminium would unite exporters to America in fury, and spark swift retaliation. Price hikes to cover the tariffs could threaten jobs in industries such as construction, oil and gas, and car manufacturing. Many more Americans are employed in these industries than in making steel and aluminium. The third option presented to Mr Trump seems more strategic. For steel, it would put tariffs on imports from only some countries, including Brazil, China and South Korea. Others, including Canada, Mexico and members of the European Union, would be let off with quotas equal to their exports to America in 2017. Only China, Hong Kong, Russia, Venezuela and Vietnam would be hit by tariffs on aluminium. But there is a trade-off. To hit the target of firing up 80% of domestic capacity, the tariffs would need to be swingeing. And even a loose quota for some exporters would create problems. The report suggests allowing importers to apply for exemptions, on national-security grounds or if they could not source products domestically. But bureaucrats were quickly overwhelmed with such requests when George W. Bush imposed tariffs on steel in 2002. If quotas are filled first-come, first-served, then exporters rush to get in quickly, and imports surge. 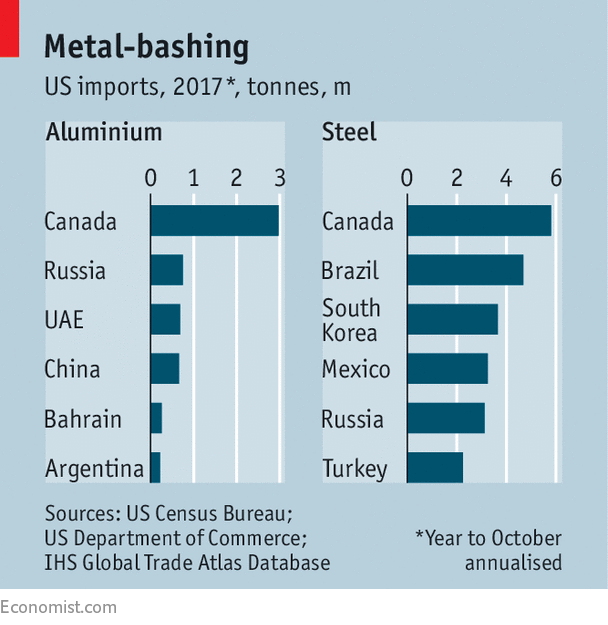 Metal turned away by America will go to other countries, hurting their local producers in turn and perhaps triggering more protectionism, as happened with the tariffs of 2002. The worst harm may be to neither America nor the countries it trades with. American law grants the president discretion to impose whatever protectionist measures he sees fit. Not international law: any of the three options would be challenged at the World Trade Organisation. The only defence would be that it was essential to America’s national security. If lawyers in Geneva accepted that, other countries might argue the same. If they did not, America might just rip up the rules on international trade and walk away.